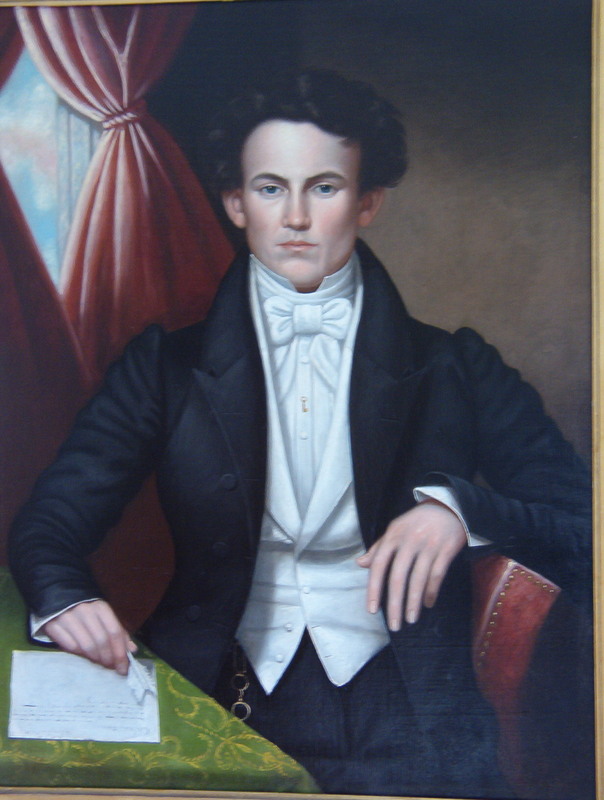 Portrait of Lloyd Granville Sampson by Cephas Thompson, 1832. Lloyd Granville Sampson (1808-1838) was the son of George Sampson and Sally Bartlett. He was born in Plymouth but moved to Duxbury as a young man. His father was the Customs Inspector for Duxbury, a role that was eventually passed on to Lloyd Granville Sampson. His sister, Sally Bartlett Sampson, married Daniel Loring Winsor in 1829. Four years later, Lloyd Granville Sampson married Daniel L. Winsor’s sister, Mary, in 1833. Thus two of the Sampson siblings were married to the children of Nathaniel Winsor, Jr., one of the most prosperous shipbuilders in Duxbury. Lloyd Granville Sampson died of consumption (tuberculosis) in 1838, leaving his wife and an infant son, Lloyd Granville Sampson, Jr. The Drew Archival Library’s Lloyd Granville Sampson Collection contains two travel journals written by Lloyd Granville Sampson, Sr.